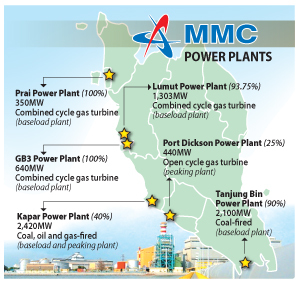 Kuala Lumpur: Malaysia's biggest independent power producer (IPP), Malakoff Bhd, may build another power plant in Johor to meet future power demands of the state. A source said the plant will be located in Johor to supply power to existing industries, but priority may be given to the upcoming petrochemical complex to be built by Petroliam Nasional Bhd (Petronas). "Part of the power plant will supply to existing oil and gas activities, help meet Petronas' expansion of its petrochemicals business and further spur the growth of Malaysia's oil and gas downstream sector," the source said. Petronas announced in May that it will be setting up a RM60 billion refinery and petrochemical integrated development roughly the size of Singapore in Pengerang, southern Johor, by 2015. MMC Corp Bhd, controlled by tycoon Tan Sri Syed Mokhtar Al-Bukhary, is the parent of Malakoff, with a 51 per cent stake in the IPP. When contacted, MMC Corp managing director Datuk Hasni Harun declined to comment. Malakoff owns or partly owns a total of five power plants in the country with a combined power capacity of 7,253 megawatts (MWs). In June, it accepted a government offer to build a 1,000MW plant in Johor. The new plant will be adjacent to the existing Tanjung Bin power plant, which is owned by Tanjung Bin Power Sdn Bhd, a subsidiary of Malakoff. It is expected to start commercial operation on March 1 2016.